NOTE: Tonight’s meetup has been canceled due to snow on the first day of spring! Please join us next week for a make-up meet-up! Have you got a domain name, but aren’t sure where to go next? 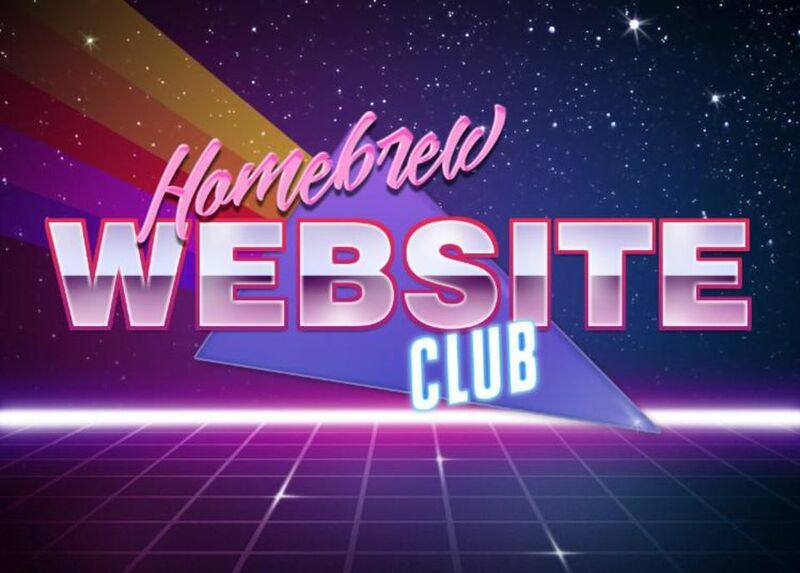 We’ll be running a short activity from 6:30pm-7:30pm to get started with website hosting! This piece is part of a series of after-action thoughts about the first IndieWebCamp Baltimore. When planning IWC Baltimore, one of the things I wanted to prioritize was having high-quality discussion sessions on Saturday, to take on issues that attendees have on their minds, and to get their creative juice's going for the Sunday project hack day. Since sessions are proposed, chosen, and facilitated by attendees, it's not possible to prepare facilitators ahead of time although there are some great guidelines for making a session good-to-excellent. People start to get tired and distracted after about 45 minutes. Each facilitator often had a different way of running their session. This sometimes led to discussion ending early, but often meant going over time. Attendees need time to move between sessions, grab water, use the restroom, etc. We mapped out several combinations of time for lunch, session length, break length, expected end-of-day, and even decoy time ("we'll tell them they have 5 minutes when actually they have 10"). 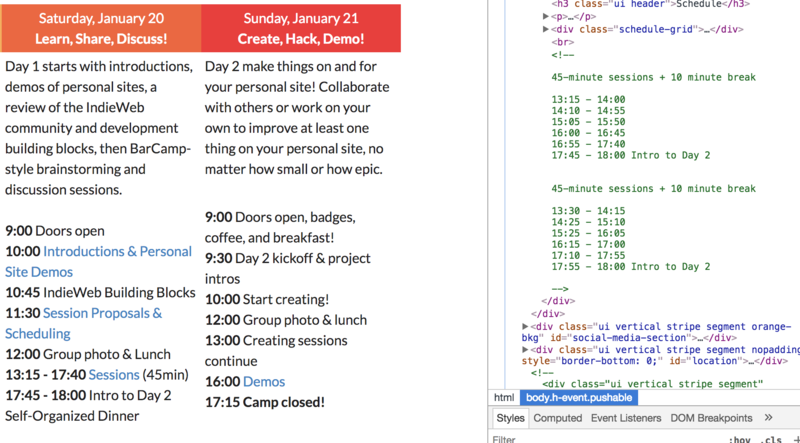 Secret schedules in the HTML! A final "Intro to Day 2" session to prepare attendees for the Sunday hackday, which we could shorten if needed. To encourage more consistent facilitation, I created a "Running an IndieWebCamp Session" card that we handed out to facilitators encouraging them to assign at least one note taker a time keeper with checks at 10, 5, and 1 minute. The card also included tips on how to kick off the discussion. SVG facilitation cards, suitable for pen plotting! Overall I think our planning really paid off. We were able to stick almost entirely to the schedule (very few sessions went over time, and none started late), the day ended on time, and informal feedback suggests that the discussions weren't hampered by the format. Our morning session went long, so there were 55 minutes for lunch rather than an hour and 15. Still, we started sessions on time. Rather than pre-prepping facilitators, we gave them the facilitator cards and explained their contents in the time between sessions. In addition to the per-session timekeepers, one of the organizers (me!) was responsible for loudly calling the end time for all sessions. Having the extra time allowed for the unexpected, such as taking extra time to end the live stream for one session and begin it for the next. I hope these notes are useful for planning future events! Meanwhile, please enjoy the videos and notes from the IWC Baltimore 2018 sessions! Feeling very grateful for all the folks that came out to make the first day of the first IndieWebCamp Baltimore a huge success! Great conversations, lots of inspiration for tomorrow’s hack day! Good morning! Looking forward to seeing folks at IndieWebCamp Baltimore today! NOTE: We are meeting on Tuesday for this week instead of the usual Wednesday. Be sure to double-check your calendars! IndieWebCamp Baltimore 2018 is a gathering for independent web creators of all kinds, from graphic artists, to designers, UX engineers, coders, hackers, to share ideas, actively work on creating for their own personal websites, and build upon each others creations. 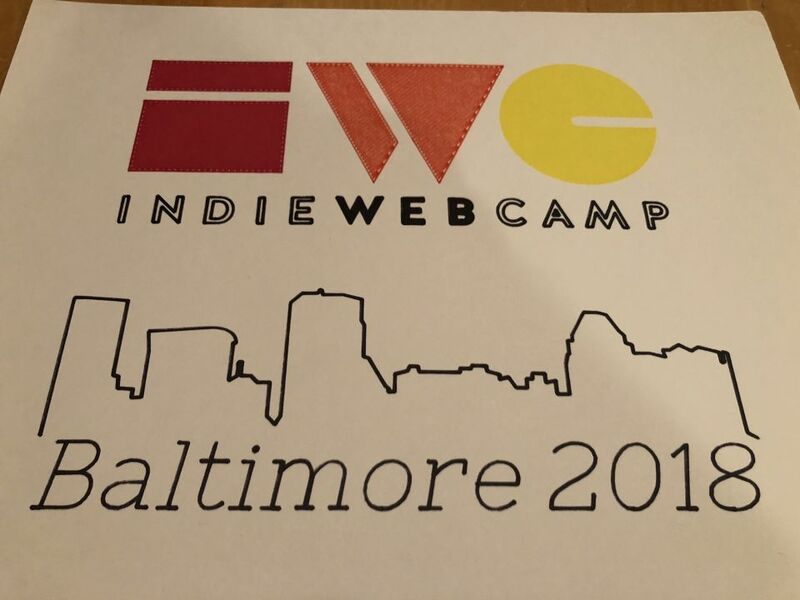 Beyond excited to be co-organizing the first-ever IndieWebCamp Baltimore! Join us January 20th-21st at the Digital Harbor Foundation Tech Center for a day of learning and discussions about the IndieWeb, followed by a day of working on projects for your own site!